The aim of these pages is to provide reflection and analysis related to the process of the project while it is happening. These pages will contain a discursive mixture of reportage, dialogue, illustration, critical reflections and emerging strategies and methodologies for creating telematic performance work. The original aims of the overall project can be read here. In this context, the phrase "telematic performance work" refers to the use of a telecommunication network to establish links between two remote spaces at the same time and to present the activities in those two separate spaces variously as a single performance event. In the case of Cellbytes, these activities will, at the same time, be presented using current software and hardware technologies to make use of the Web as a third performance "space". 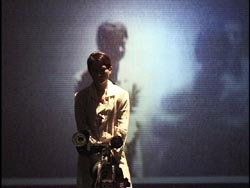 As with many "new media" projects, telematic performance work can be traced back along historical and aesthetic trajectories that include and overlap with a range of art practices including installation, performance and communication art, video, etc. In doing so, one encounters many of the same concerns being addressed using different forms of technology in different contexts. In addition to the telematic work -- another aspect of the Cellbytes project has been to utilise a triggering/ sensor environment in each space. This has had particular implications for the dancers who need to adjust to several degrees of disorientation in the spaces. The group process model being used on this project is inter-authorship with a very strong emphasis on the pooling of skills and ideas, the constant interweaving and, in particular on this project, the crossover between the creative processes of dance/ choreographers and media/ technician artists. Navigation of this Site: Under the Menu there are five items; 1) a Word/ Phrase Index where you can find a single alphabetical list of many of the key terms and phrases around which this documentation is oriented; 2) a link to the Cellbytes Homepage which has introductory information including a list of participants and their biographies; 3) a link back to this Documentation Introduction page; 4) a link to the Streaming Rehearsals page; 5) a link to the Presentations page with some details about the public Network Days 27 and 28 July 2000.